Tianjin First Center Hospital(TFCH)，one of the medical centers in Tianjin, is a comprehensive hospital in medical treatment, medical teaching, scientific research，disease prevention and health care. This hospital takes Organ Transplant, Emergency Medicine and Otorhinolaryngology as its hallmark and has been categorized as a Tertiary Grade A hospital. The hospital has more than 1,500 beds and consists of 47 clinical professional departments. Five of them are national key professional departments (including Organ Transplant Center, Critical Care Medicine, Key Laboratory, Integrated Traditional Chinese and Western Medicine and Laboratory Department). Three of them are municipal key professional departments (including Organ Transplant Center, Critical Care Medicine and Otolaryngology-Head & Neck Surgery). 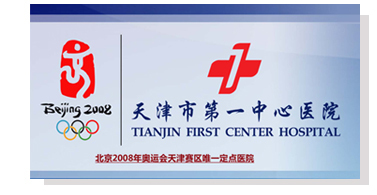 Six of them are municipal research institutes (including Tianjin Organ Transplant Institute, Tianjin Emergency Medicine Institute, Tianjin Otorhinolaryngology Institute, Tianjin Medical Imaging Institute, Tianjin Thrombosis and Homeostasis Institute and Tianjin Hospital System Engineering Institute). The hospital has a key critical care medicine laboratory, affiliated with the Ministry of Health of China and a clinical medicine post-doctoral workstation. Annually the hospital has more than 2,000,000 outpatients and 50,000 discharged patients. It has a strong technical force of more than 2500 professionals. Among them, 450 people are honored with senior professional title, 34 experts received the special allowance of the State Council, 798 people have their doctoral or masters’ degree, 87 people are supervisors of doctoral or master’s degree students. Tianjin First Center Hospital undertakes the theoretical and clinical teaching of postgraduate, undergraduate and vocational students from Tianjin Medical University, Medical College of Nankai University, Tianjin University of TCM, Medical College of CAPF and Tianjin Medical College. The hospital also undertakes standardization training of residents and general practitioners in Tianjin and medical teaching of clinical medicine post-doctoral workstation. Obtained more than 150 awards which including the National Science and Technology Progress Award, Tianjin Municipal Science and Technology Progress Award and the Chinese Medical Science and Technology Awards etc. The hospital, as Tianjin International Medical Center, undertakes health care tasks to foreign guests, retired cadres and high-level intellectuals in Tianjin with a beautiful environment and excellent service. It was defined as the only designated hospital for the Beijing Olympic Games in Tianjin in 2008. By now, it has won several honorary titles such as "National Top Ten Baby-Friendly Hospitals", "National Best 100 Hospitals", "National Model Hospital for Patients", “the Fourth National Health Culture Construction Advanced Unit” and “Tianjin People-Satisfied-Hospital” etc. “Life-entrusted, quality-oriented” Tianjin First Center Hospital always adhere to this important concept in human health service.